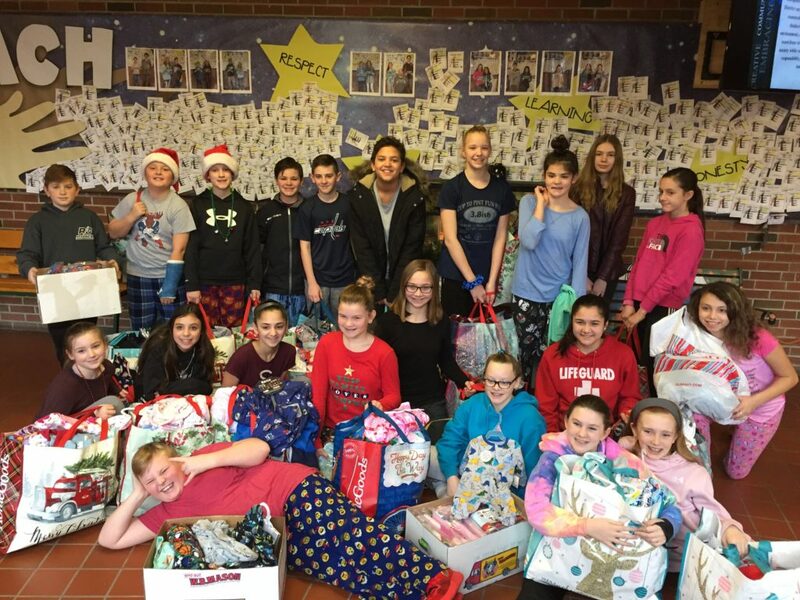 Students at Wilbraham Middle School outdid themselves this winter, drumming up donations of 614 pairs of pajamas to distribute to children living in Springfield Housing Authority developments. Stacy Dwyer, who teaches sixth-grade students in Wilbraham, said the successful ‘Pajama Drive’ was done by students at the entire school, between Thanksgiving and Christmas of last year. She said children were more enthusiastic than ever to help provide brand new sleeping gear for the SHA. “The children really got into it this year,” said Dwyer, who began the holiday drive five years ago, starting with her own class. So enthusiastic were her own students that the project was expanded to the entire school the following year, in 2015. Dwyer heads up the program at her school, through the Scholastic Book Club’s Great Bedtime Story Pajama Drive,’ in which school children across the country donate new pajamas to be distributed among agencies and housing developments where they are needed. Nationally, the drive in late 2018 raised some 123,123 pairs of pajamas for children around the country. In the case of Wilbraham Middle School, pajamas donated this year went to local organizations including the SHA. SHA Executive Director Denise Jordan thanked Dwyer and the students for their willingness to do good for others, and for their energy and commitment to collecting pajamas from the school community. Resident Services Director Pamela Wells said the pajamas are being distributed among family developments across the city, including Duggan, Moxon, Reed Village, Riverview, Robinson Gardens and Sullivan Apartments. “We’re very grateful for the generosity and enthusiasm of the children at Wilbraham Middle School,” Wells said, noting that the SHA has received pajamas from the school in prior winters. At SHA, distribution of the pajamas often goes hand-in-hand with books from another partnership, with the Book Rich Environment program, which is courtesy of a national coalition that includes the U.S. Department of Housing and Urban Development, the U.S. Department of Education, the Campaign for Grade-Level Reading, the National Book Foundation and the Urban Libraries Council. SHA, and the City Library are local partners, giving out some 4,000 books per year to children from infancy up to age 12. 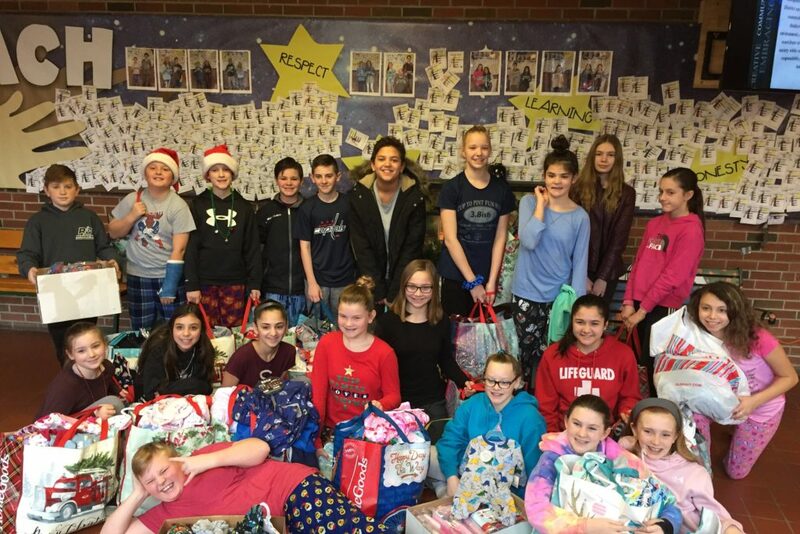 Sixth graders at Wilbraham Middle School with pajamas they collected for children at Springfield Housing Authority. Helping distribute the pajamas are staff with SHA’s Talk/Read/Succeed! family-based early literacy program underway at three family developments: Duggan Park, Robinson Gardens and Sullivan. At Robinson Gardens, T/R/S! Program Coordinator Lynne Cimino said the program has been a benefit all around. “The kids love getting pajamas and of course they always love the books,” Cimino said. Dwyer said the drive includes discussion and a video of children around the country who have gotten the pajamas in past years. The drive gives children the benefits of doing community service, as well as seeing how those of lesser means get by. 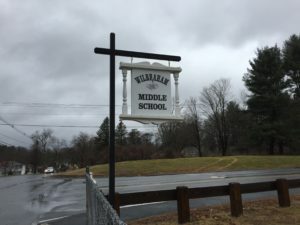 This recent pajama drive included donations from local businesses associated with parents from Wilbraham Middle School, in an effort where giving turned out to be contagious. “Every year, it gets bigger,” Dwyer noted.